We've got to do better than this guys. Have you seen Brickell? It's a light-up winter wonderland. Our "decorations" are an embarrassment - a half wrapped light pole and some snowflakes on ugly dying plants? Come on! Ahh, I long for the days of Snow Days. 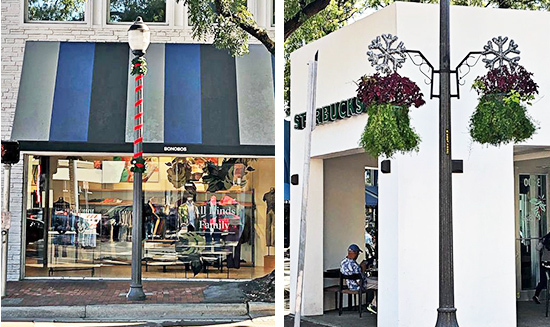 The BID is holding a "Light up the Grove" holiday decor and storefront challenge. Add lights and decorations to your storefront and you're in the contest. They suggest leaving the lights on until midnight, by putting them on a timer. They will then take photos and put them on their social media pages and their followers will vote on the best. The contest ends December 15, of course we hope you leave your decorations up until after the holidays. The business with the most "likes" on social media will receive a social media boost ad valued at $150.00. Light it up!! Otherwise nobody will be able to avoid the missing bricks or tree roots in the sidewalks, read the For Lease signs or see into the empty spaces. Show some pride Coconut Grove, we have some of the richest concerned property owners in the country, they don't even need tenants to pay rent or their real estate taxes. These properties are for their kids' kids, who cares about the Present Value? Light up the countless construction cranes at every corner. That would make quite a sky-high spectacle! If Terra and the other mega-developers lit up their highrises satelites in space would fail and traffic would collapse. I just had brunch at Lulu's as Greenstreet had a 40 minute wait and the West side of the Grove was hopping. It was great to see people back walking around, eating, shopping. The problem is that once you cross the triangle intersection you are faced with nothing appealing. The biggest eyesore is the block of buildings where Johnny Rockets, Soles, Smoothie King, etc used to be. They kicked out all of the tenants, partially demolished the interiors and walked away. I've talked to the BID about having them at least place brown paper over the windows so you can't see the mess when you walk by, and Nicole, the head of the BID, said she has tried on numerous occasions to have them do so...even going so far as offering to do it for them at her expense and the building owner is refusing. At least the other construction sites are moving forward and there is some end in sight but this block of retail has been a mess for months.